"Spacial Integrity is about a logical interior strategy that conveys an emotional outcome"
““Is this really my home? How did you know exactly what I wanted? It’s perfect!” – clients have said when seeing their completed home for the first time. Award Winning Interior Designer, Heddy Z is one of Southwest Florida’s most sought–after designers – widely acclaimed for her discerning taste, eclectic eye and great sense of style. Keen intuition and 25 years of experience enable Heddy to translate her clients’ visions into perfect living spaces, specifically when clients cannot articulate them themselves. Using this innate ability, she is able to design and create the ideal space plan that reflects the personality, ambiance, and needs of her interior design clients. Heddy Z’s demand for excellence and her attention to detail ensure end results that consistently exceed clients’ expectations. 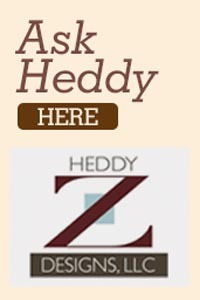 Wanting to demystify the process of Naples interior design, Heddy has created a blog, “Ask Heddy” which is housed on her website. With humor and an enticing writing style, she offers design advice on a wide variety of topics and also showcases unique and beautiful products that bring style to any home. The information on her blog has helped readers to better understand and appreciate the fine nuances of interior design. Some of the most recent topics on her blog include: “Designing a Bathroom – Where do I Start?”, “How to choose a paint color”, Renovation – Expedition”. Heddy is a featured “Designer on Call” at the prestigious Miromar Design Center in Estero, Florida. She has participated in a variety of seminal design projects, including both the Dream Homes and the Designer Showcases. Her interior design vision and talent have been recognized through numerous awards. Among them are the Collier Building Industry Association’s Award for Best Interior Merchandising, and the Naples Illustrated Designs of Distinction award. Her firm’s interior design projects have been featured in numerous interior design publications, including: Architectural Digest, Naples Illustrated, Gulfshore Life, Florida Design and Estates of Distinction.